Sometimes people don't have the choice to drink or not drink from a water source. If the choice is drink or die from dehydration, you drink. This picture shows the dire need of some of our neighbors in the world. 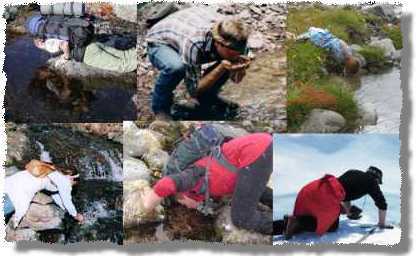 For those people that choose to enjoy the outdoors and experience the wilderness, drinking raw water is a choice. Sure, it makes a great picture of Suzy getting a refreshing drink from a clear mountain stream high in the Rockies, but she may pay dearly for that drink a few days later. Have you ever done what these dudes are doing? Here's the problem. Take a look at what may have been in that water before you drank it. How gross! I'd sure rather not drink what all these characters may have left behind. For 50 extra bonus points, figure out which of these polluters is probably the most dangerous to the water you might drink from a stream - then check at the bottom of the page. Many of our country's streams, lakes, and rivers are sparkling clean. Unfortunately, they only appear clean. The Environmental Protection Agency (EPA) reports that 90% of the world's fresh water is contaminated. Since fresh water is 2.5% of global water, that means around 0.25% of all the water in our ecosystem is drinkable and uncontaminated. Chances are high that a drink from any water body will include contaminants that may harm you. Giardia is a well-known wild water contaminant that is a primary concern of backpackers. Recent studies show that bacteria and viruses are the actual cause of many backcountry illness and ingestion of unclean water is a simple way into the body. Viruses are much smaller than giardia and bacterias. Giardia protozoa can be removed from water with a 1.0 micron water filter, but viruses require a pore size of less than .02 microns so a water purifier or other methods are required to remove or kill them. Any critter that exists in one human has a high probability of being able to infect another human. 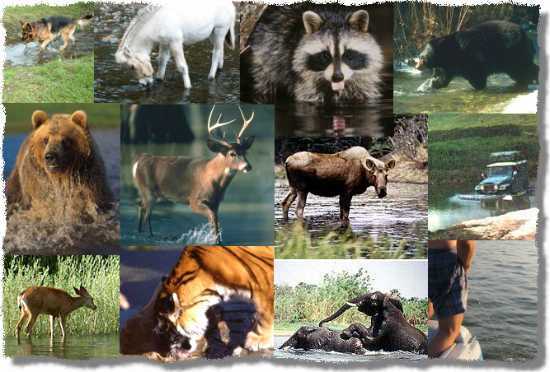 Something that infects a squirrel or deer may not be compatible with a human host. So, drinking water polluted by something like racoon feces will have a lower probability of making you sick than water that another human used for a toilet. The more similar in metabolism two animals are, the more probable it is that waste from one can sicken another. To protect other visitors to the wilderness from pollution in drinking water, good outdoors dudes will always follow good camping/hiking guidelines. If you read the rest of the page, you should know that human feces is the worst thing you might have mixed in your drinking water. So, that bad dude peeing in the water is the most dangerous to us - we are our own worst enemy.